@ankitgupta As per my understanding the originator can restrict other players from selling that drug even after the patent expiration. Please let me know if my understanding is correct. Yes the innovator will play all cards available to delay the launch of competitor products even after the expiry of patents. He will cite any available reason to justify his case. Immediately after expiry of patents the USFDA grants final approvals for few players who have filed early and whose tentative approvals they find in order. These few players get to launch in limited competitive period (exclusivity is often the term used) and end up getting the big dollops before severe price erosion sets in and multiple players get into the fray. But many a times this early launch is “at risk” launch wherein the innovator might go for litigation and if the innovator wins then the other players suffer big damages. The other option for the other generic players is to enter into a sort of understanding with the innovator and decide some terms and conditions after which they are spared the risk of litigation. It can sell the drug only after getting final approval from USFDA and all the litigations are ruled in generic company’s favour. Other competitors will only be allowed to sell after getting approval from USFDA. The revenue from the product will only start after it gets final approval mostly after Nov. 2017 and by that time other competitors who have file Para IV/FTF might also get approval. For detailed learning, you can google about it. Everything is available on internet. any one having any update on result ? lacosomide - court ruled against generic companies - matter will go to appeal. The DMF filing upto Sep 30, 2016 is out and Alembic has filed one DMF during the quarter (Q3CY16). The generic Gefitinib (for non-US market) is manufactured by ~12 cos., RPG Life Sciences, Neon Lab, Resonance Lab, Lyka Lab, Natco, Miracalus etc. Iressa has been retailing in US at ~7400USD for 30 capsules; stable price since past 2 years. Alembic gets USFDA nod for two small molecules (market size wise) in last fortnight. Fair question. Form 483 is now commonplace. 483 basically contains inspectional observations. Data fudging, omission, false reporting and/or process failure related observations are high severity in nature; a serious US-facing pharma player would strictly avoid getting these. Other observations related to hygiene, awareness and/or documentation discipline are quite widespread, however not high severity in nature. Thus severity of observation can derail whole story (not Form 483 per se). What in your opinion are the major risks? Regulatory Compliance. We are taking this very very seriously. When we were small it was easy to manage. But as we scale up we need to ensure systems and processes that take care of ensuring quality. Kindly give us a sense of how seriously this is taken by Top Management? The normal practice in the industry is to employ 1:2 Quality:Product personnel. At Alembic we are maintaining a 1:1 Quality: Product personnel ratio. We ensure everything is on the SAP ERP system. We have built a strong Quality Team. When the Board meets, the first item on the Agenda is USFDA Compliance. And usually it takes 3-5 hours. 4 ANDA filed in Q3, 3 approvals received. These are very good set of numbers. The bottom line/EPS seems depressed due to higher R&D cost but it is really like investing in future at the expense of today. This company scores high on Point number 3 - R & D Culture, Size of R & D w.r.t. Size in Phil Phisher’s book. The size of R&D w.r.t. revenue if significant, there is a successful R & D culture at the Alembic & there is really nothing to suggest otherwise. Also when they have reached the size of 0.5bn$ in sales, they really have to think big & transformational to grow from here. Does anyone here thinks company is spending too much on R&D? Such investments may not always pay-off. Investors are also likely to demand higher discount rate to account for risks ahead. Have they hired any industry veteran to lead the R&D efforts? Given the market cap size of alembic, it does seem that the R&D investment should be typically lower if we compare to industry averages. However, I personally feel that R&D investment is the main driver for alembic if it wants to aggressively venture into the US market in the long run, especially when “winner take all effect” is dominant. Small cap pharmas can’t afford to file many ANDAs as they are expensive. Even if one files a single ANDA, the chances of it paying off generously, is typically low (as you rightly mentioned). Hence, it becomes kind of essential to file many, many ANDAs to increase the chances of catching a windfall (a single blockbuster ANDA can make a huge difference to Income statement). Its very unpredictable to know which one of them would take off. But nevertheless, filing more of them definitely increases chances of huge payoffs from few of them. I think Pareto 80/20 principle (or power law) comes into play here. Going forward 5-10 years down the line, I speculate that there would greater rift between small cap and large cap pharma companies, simply because of the sheer ability of large cap pharmas to file many more ANDAs and ramp up the production facilities accordingly. In the Valuepickr Alembic management Q&A, the management has mentioned that they have made a product roadmap till upto 2024! My limited understanding tells me that the only “risk” involved in doing more R&D, is an impact on the operating margins. If the US companies decide to sue/challenge the ANDA filings which comes out of R&D, there are always other options to negotiate (again mentioned in the Alembic management Q&A). 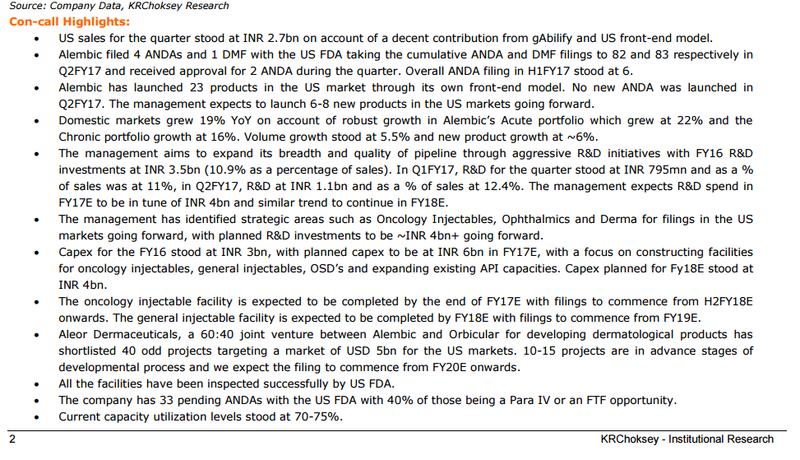 My noted points in Q3 FY17 conf call of alembic (mostly focused on US generics). 26 new products with alembic label. Front end has been successful as per the management. My summary: Company is investing heavy in R&D and building new facilities/capabilities. fruits for which will be available FY19 onwards (pains today, gains tomorrow).